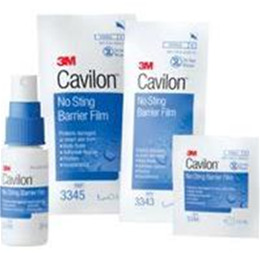 3M Cavilon™ No Sting Barrier Film is fast-drying, non-sticky, alcohol-free liquid barrier film that form a breathable, transparent coating on the skin. It is designed to protect intact or damaged skin from urine, feces, other body fluids, adhesive trauma and friction. A hypoallergenic, non-cytotoxic liquid film which will not sting even when applied to damaged or denuded skin. 3M Cavilon™ No Sting Barrier Film is CHG compatible. Sterile, non-cytotoxic will not interfere with skin or wound healing. Proprietary formulation with unique terpolymer for skin protection. Contains a plasticizer to form a flexible protective coating. Will not clog or reduce absorbency of diapers or pads. Hypoallergenic.